If you are looking at going through a bad credit car refinance, there are several things that you will want to consider. This process can provide you with a number of benefits along the way. Here are the basics of auto refinancing when you have bad credit. The basic idea behind this process is simple. You are going to get a new loan for your car. You are going to take the money from the new loan and use it to pay off your existing loan. The title for the car will then be transferred to the new lender, and you will start making payments to them. One of the major reasons that people choose to refinance their auto loan is to take advantage of a lower interest. Many times, the market interest rate is going to be lower than what you have with your current auto loan. If you can refinance the loan, you will be able to lower your interest rate, which will also lower your monthly payment. This can allow you to save money on your car payment regardless of how far along you are with the loan. Another reason that many people choose to pursue a car refinance is to extend the amount of time that it takes to pay off the loan. For example, let's say that you purchase a car for $10,000, using a five-year loan. Then after three years, you have paid down the balance to $5000. If you choose to refinance, you will be able to start a new five-year loan from that point. Then you will be paying $5000 over the course of the next five years, which will significantly lower your payment. This process will usually work only if you have been paying on your existing auto loan for a number of years. It does not necessarily require you to get a lower interest rate than what you already have in order to save money. 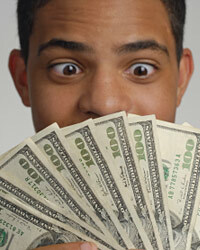 When you have bad credit, you may not be able to find the interest rate that you want. Most of the time, lenders are going to extend you higher interest rates if you have bad credit. This is their way of protecting themselves from the increased risk of taking you on as a customer. One of the best ways to get around this problem is to get a cosigner. If you know someone that has good credit and would be willing to sign the loan with you, you may be able to get a much better deal on an interest rate. The cosigner will not necessarily have to make any part of the payments for you. They are there simply to guarantee the loan for the bank. It may be difficult for you to find someone that is willing to cosign the loan with you, as this is a risky proposition. However, if you can get someone, your odds of being able to refinance and get a lower payment are significantly better.